and several rays of sunshine peeking through the fog as I awoke and started the day. before the next round of storms moved in later in the afternoon. while soaking in a hot bath... absolutely relaxing. I am definitely a warm weather sunshine girl. I love to bring home a bouquet of beautiful fresh flowers. A vase of flowers does so much to warm up a room. a couple of weeks ago so I was so excited when I found these at Costco. for just a few dollars more than the grocery store sells one dozen roses? 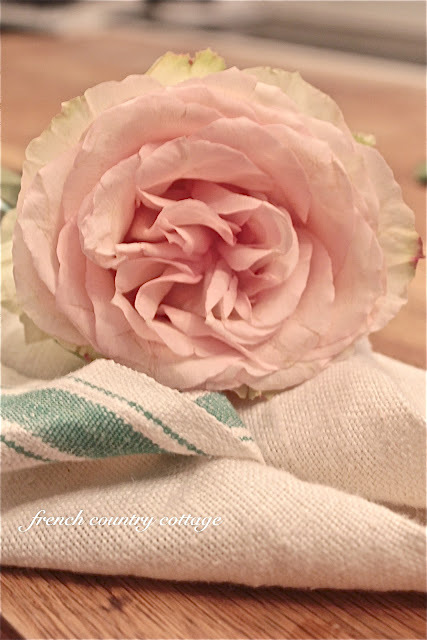 Some suggested they were cabbage roses~ any rose growers out there have any info? but they have opened into absolutely amazing huge full blooms. Soft pink & edged in green these roses have quickly become my favorite variety. my hydrangea soaking up a bit of water in the sink. Fill my collection of galvanized buckets with flowers and set them in the window sills. today these pretties blooming away are warming me even more. I am sooo ready for Spring!! Those are the most gorgeous flowers. Connie at Hartwood Roses blog could tell you what they are. She grows roses. Love seeing your kitchen. Not sure I have seen all of it. Those roses are just gorgeous! They do look very much like Peonies, especially because of their size ~ we are having abosuletly gorgeous warm weather here in Michigan; it was almost 80 degrees here yesterday, but just a bit cooler here today ~ will be hanging some laundry outside to dry :) Enjoy your lovely flowers!! Soooo pretty! I love your kitchen, I think I have kitchen envy! Happy Sunday to you! Sounds perfectly dreamy to me! I think you should definitely do that. Then, take lots of pictures so we can pretend we are too ;) The roses are stunning, enjoy them. the top photo looks like dreamy heaven!thanks for mentioning my giveaway. Oh I love your kitchen. I was just considering a outing to pick up some cute flowers. What do I love most? YOur roses or your photos or your kitchen?? ITs a toss up!! I love those big fat abundant roses with a million petals. I haven't seen them at costco, or they woulda been in my cart too. WOw...all I can do is sigh..........such beauty! 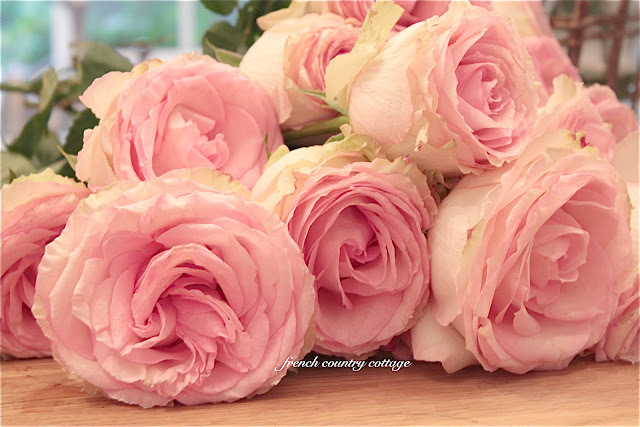 The roses are gorgeous, Your kitchen looks gorgeous to can we see more. Thanks for sharing. Oh Courtney, they are beautiful blooms and thank you for sharing your gorgeous photos of them. Your kitchen is just so lovely, and the contrast of the white with the black painted island cabinet is perfect! Taking a run to costco this week and will have to pick up some of those roses...they are absolutely stunning! So very pretty. Makes me want to go to the store and bring home some bunches of flowers. 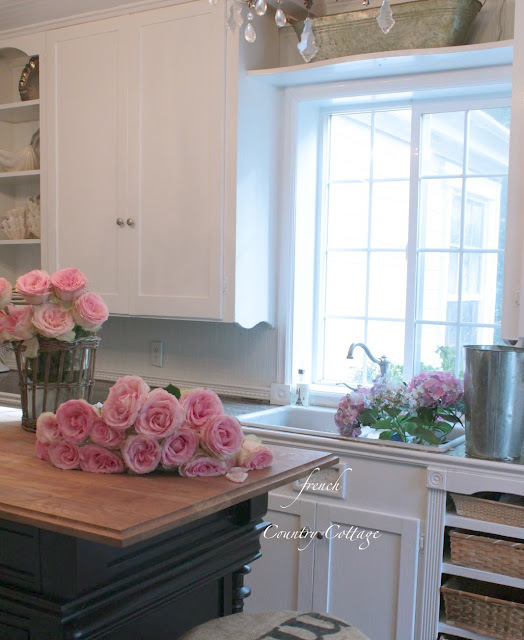 Beautiful roses and a beautiful kitchen! Those are some of the prettiest roses I've seen in awhile. Thanks for sharing. Your blog began like Wizard of Oz with no color and then ended with a burst! LOVED it!!! hi Courtney the roses are beautiful and I'm loving your kitchen! it's gorgeous. You are finding the most beautiful roses at your stores.We are enjoying the most incredible weather here.Summer came before spring! They are just beautiful, Courtney, and I love that shade of pink! I did think they were peonies for a moment the flower is so large. I left behind four peony bushes in our old house's garden. I'm still waiting to see if there is anything interesting planted around the condo before I go out and buy a few hydrangea bushes. I also left several of those, too. It seems we are allowed to plant small perennials and annuals. I'll keep to containers mostly, but I do like to have some pretty flowers around the outside of a house. I'm pretty sure your kitchen couldn't be any prettier! Oh my gosh, i love your island, and your sink, the baskets and open cabinets and just everything about it, and the roses just make it all the better. They are gorgeous! Gorgeous roses! Too early here for them but I am looking forward to my peonies and their wonderful scent! 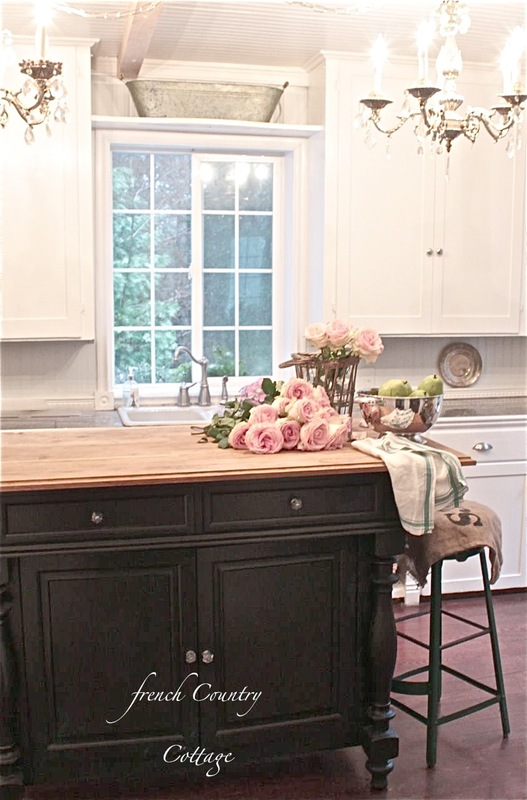 Beautiful kitchen and it makes a wonderful flower room! Thank you for sharing your armload of blooms our way! Just dreamy! 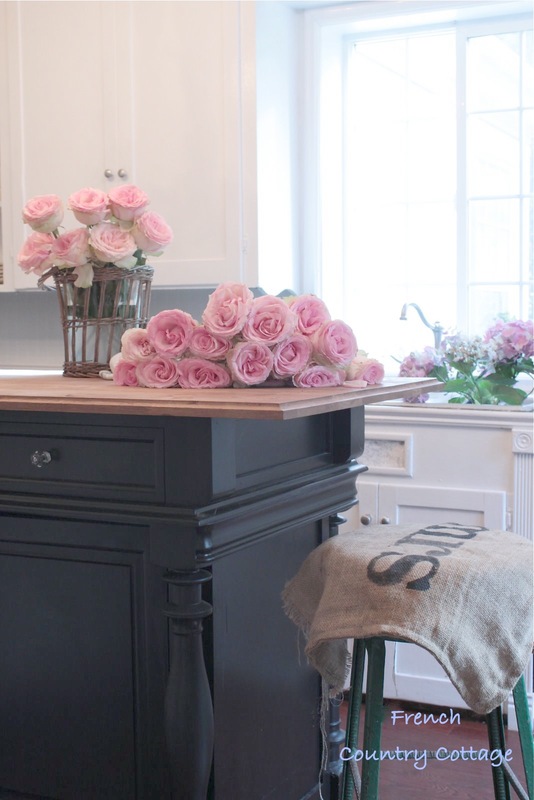 Well, I love your roses and I really love your kitchen island! I love those kind of roses too but could not classify them. Compliments on your beautiful kitchen! Oh my goodness! When I saw those roses I was like Holey Shmoley! I thought this whole time you probably went to a florist and got these beauties, but when you mentioned Costco, I was like wha? I told my husband we have to go to Costco ASAP, haha! I was at Costco last week I should of paid more attention to the flowers, but I don't remember seeing any as pretty as those. Maybe they just look extra nice in a clean kitchen! Completely agree, flowers are just perfect for warming a home and brightening everything on a dreary day. Those are truly beautiful roses! Flowers are BEAUTIFUL! I guess the grass is always greener. I live in Florida..where the sun has been shining and the weather is summertime warm! It's enough to drive you insane. I would love a chilly, rainy day! Silly..I know. Perhaps they are "amnesia" roses? Here is hoping for spring to be just around the corner!!! Beautiful post Courtney and thank you for sharing your roses and the great price that you got on them at my party. Absolutely gorgeous! I would love to know where you got your lovely dish towels. They are the perfect color for my kitchen. Thanks! Oh, your home AND those flowers are all just beautiful! I, too, love Costco to buy roses. If I need more than a few bunches (or certain colors) they will special order them for no extra charge...they just need two weeks' notice. I saw your post over at "Inspiration Friday" blog party. Love the roses, and the kitchen what an awesome post! Hope you stop by my place. Those flowers are gorgeous! Thank you for the beautiful pictures of you beautiful kitchen! 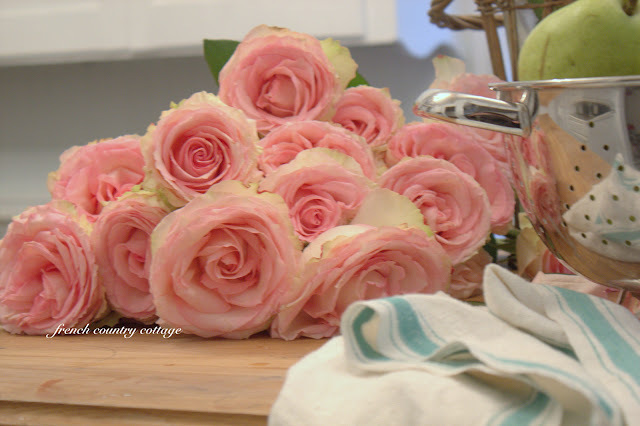 Gorgeous roses for a gorgeous kitchen! I've never looked for flowers at Costco before, but will definitely check them out next time I'm in there. Thanks for the touch of spring. Love your roses and your kitchen too! Thank you for joining me at Home Sweet Home! Almost all of the cut roses that we buy in stores or get from the florist are specially grown from plants bred for the purpose. Most of these grow in greenhouses, shipped from South America. They're not the same roses that grow in our gardens ... though some florist roses DO make fine garden plants.